the boo and the boy: IT IS FREAKING HOT OUT!!!! IT IS FREAKING HOT OUT!!!! 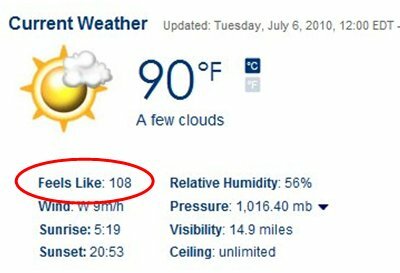 It is disgusting outside (see temperature circled in red). The kids keep wanting to go out but the second you walk outside, the humidity hits you in the face and you immediately start sweating. GROSS. The weather here in Ottawa is ridiculous. In the winter it can get as low as -40 and then it gets this bloody hot in the summer..
Wow that is intense as!! I'm so glad that here in New Zealand the lowest it gets (where i live) is only -4 (degrees Celsius) And hottest probably only 28 (degrees Celsius)lol. Keren - I wish we only got down to -4. I could tolerate that. -40 is way too cold and it makes our winters truly miserable. And the fact that it'll have been in the forties (celsius) for a week is too damn hot. Thank goodness for air conditioning! Good luck getting through your winter! Holy hell. That's what it was like here last weekend. With no air conditioning. (Don't ask--it just pisses me off at Joe--it's in now that we don't need it.) And company. EEEEEEKKKKKK. We spent 2 afternoons at the lake on a new beach about 8 blocks from our place. The water was cool and lovely but man, even walking across that sand to get to the water was brutal. I really try not to complain too much about our summer weather because it beats winter any day. I DESPISE winter here. Too bloody cold and way too much snow.